Spondylolisthesis is a spinal condition in which one vertebra slips forward over the vertebra below. Degenerative spondylolisthesis, usually occurs in the lumbar spine, especially at L4-L5. It is the result of degenerative changes in the vertebral structure that cause the joints between the vertebrae to slip forward. 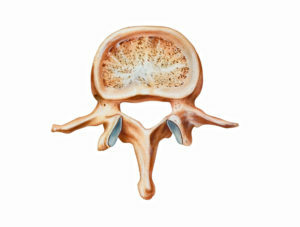 This type of spondylolisthesis is most common among older female patients, usually those over the age of 60. Diagnostic tests. Generally, doctors start with x-rays, which allow them to rule out other problems such as tumors and infections. They may also use a CT scan or MRI to confirm the diagnosis. In some patients a myelogram will be used. This is a test that involves the use of a liquid dye that is injected into the spinal column to show the degree of nerve compression, slippage between involved vertebrae, and abnormal movement. In general, the physicians use the Meyerding Grading System for classifying slips. This is a relatively easy to understand system. Slips are graded on the basis of the percentage that one vertebral body has slipped forward over the vertebral body below. Thus a Grade I slip indicates that 1-24% of the vertebral body has slipped forward over the body below. Grade II indicates a 25-49% slip. Grade III indicates a 50-74% slip and Grade IV indicates a 75%-99% slip. If the body completely slips off the body below it is classified as a Grade V slip, known as spondyloptosis. 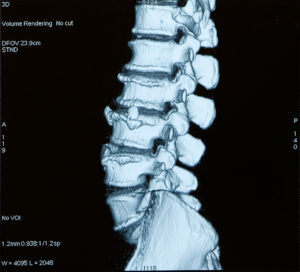 Degenerative spondylolisthesis can be progressive – meaning the damage will continue to get worse as time goes on. In addition, degenerative spondylolisthesis can cause stenosis, a narrowing of the spinal canal and spinal cord compression. If the stenosis is severe, and all non-operative treatments have failed, surgery may be necessary. Most people will experience some degenerative changes in their spines as they age. However, severe spondylolisthesis only affects a small percentage of the population. Overall, most degenerative disorders of the spine can be treated successfully using non-surgical methods. Your doctor will work closely with you to find a treatment method that is best for you and help you return to an active lifestyle.